1.4 Given a scenario, configure the appropriate IP addressing components. This is our Part 1 of 2 for sub-objective 1.4. For the remainder of sub-objective 1.4 go to Part 2. In this installment of ExamNotes for Network+ N10-007, we will examine aspects of IP addressing and using virtual as well as physical methods to explore them. 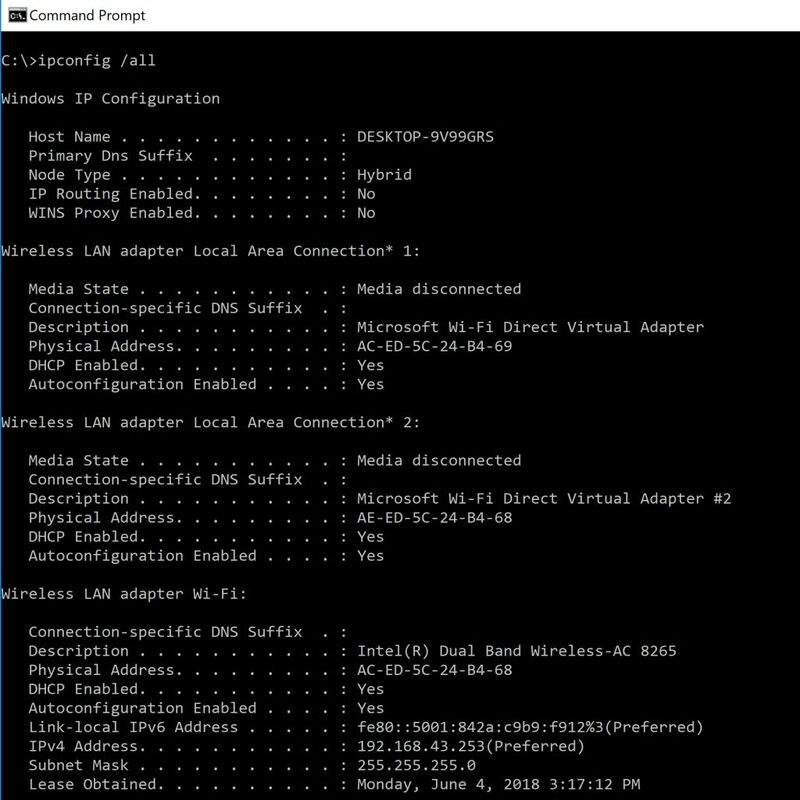 Let’s start by reviewing the output of the ipconfig /all command from a typical SOHO computer’s wireless adapter. Public network addresses are licensed by IANA in three classes Class A Class B and Class C. Here is how these address octets break down. An x in this table indicates portions of the public-address octet available for host assignment, 0-255. The total scope of IPv4 addresses is 4,294,967,296 addresses. This would seem sufficient, but in fact, this range is in the process of being exhausted. One method to alleviate the need for addresses in the public space is private addressing. Here one public IP address can be used by a router to communicate publicly and the router will issue and issue private non-routable IP addresses to its connected network nodes using NAT/PAT. This technique is used heavily in both business and SOHO deployments. Private addressing can provide millions of private networks and billions of host addresses. Your refrigerator or television’s connectivity need not rely on a public address. Here are the address scopes available for private addressing. Remember these addresses are non-routable and will not pass through the router without address translation. Some network addresses and ranges are reserved by TCP/IP for specific purposes and should not be manually assigned. Review this list of addresses and functions. 255.255.255.255 Broadcast address. This address is used exclusively for broadcast transmission intended for every node on the network. 127.0.0.1to 127.255.255.254 Used for the PC network interface validation shown below. 169.254.0.1 to 169.254.255.255 Assigned be APIPA to hosts using DHCP that are unable to obtain an address lease. A loopback address is used to send and receive ICMP ping packets in order to validate the TCP/IP configuration. This confirms the correct configuration of both the TCP/IP protocol and the interface itself. Perform this test by typing: ping 127.0.0.1, and examining the results. A gateway performs the address translation necessary for your private network to communicate with the public network. A specific address, usually the router, is configured on each host as the default gateway enabling each host to communicate externally while using only the router’s external address. When you look at server clustering and load balancing you will see it is important to manage the network load on the servers. Server clustering allows a group of servers to work together while appearing as a single virtual IP address. When a node is ready to transmit it uses the network ID to determine if the recipient is on the local network. If not the transmission is directed to the gateway for address translation and forwarding. Subnet masking is used to adjust the number of bits assigned to the network portion of the address with the remaining bits used to identify the host. You will encounter many Class C addresses in your studies so we will use one here. Remember that IP addresses represent groups of bits. So the IP address 192.168.2.101 in binary form is 11000000.10101000.00000010.01100101. Using a subnet mask of 255.255.255.0 (11111111.11111111.11111111.00000000) assigns the first three octets or 24 bits to the Network ID. And the remainder to the Host ID. In this case, the Network ID is 192.168.2.0 and your Host ID is 101. As we move on you will see how these values can be adjusted to fit your specific needs.